When referring to homelessness, one often thinks of grown men or women in need of housing. However, children are affected just as much as adults. 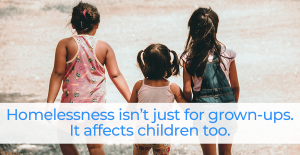 According to a recent survey by the National Center on Family Homelessness, 1 out of every 30 children in America is homeless. If that staggering statistic didn’t make your jaw drop, think of it this way: If the average American classroom size is about 24 students, that means your own child more than likely has at least 1 classmate who has no home. Unfortunately, that number is also on the rise. In fact, in New York City, 1 out of every 10 public school students was homeless at some point in 2016. There are several reasons why children can become homeless. Per the 2007 Hunger and Homeless Survey conducted by the United States Conference of Mayors the top three contributing factors for homelessness among children are lack of affordable housing, poverty, and domestic violence. Children who have experienced homelessness can often struggle to stay on the path to a good future for themselves. It is important for children young and old to have a routine and a constant supportive environment in order to succeed. Having no place to call home can cause serious issues. So what can be done to help these homeless children succeed? Research, volunteering, and monetary donations can all be helpful. Give children and their families the tools they need to succeed in a world that may have been turned upside down for them. In some cases, children do not even have school supplies to complete their work. If you know of a child who may be struggling or is without a home, step up. We can all do our part to give all children a bright future. The COSAC Foundation has been around for 21 years providing help for the homeless population in the form of access to employment opportunities, hot meals, and most importantly shelter. COSAC’s Homeless Voice program distributes a street newspaper in Florida with its main function being to educate the public on homeless prevention and poverty issues, provide temporary employment to those without a job, and raise additional funds for the Florida based shelter.